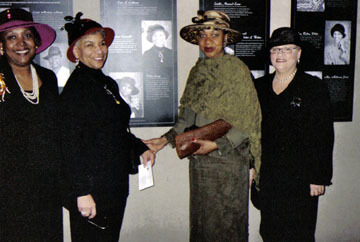 On February 25, 2005, the Geva Theatre in Rochester unveiled Uncrowned Queens In Their Hats which was on display during the theatrical run of Crowns by Regina Taylor. The Mayor of Rochester, William A. Johnson, Jr., and the President of the Common Council, Lois J. Giess, presented each of the Uncrowned Queens, Dr. Peggy Brooks-Bertram, and Dr. Barbara Seals Nevergold with a proclamation naming February 25th as Uncrowned Queens Day in Rochester, NY. In addition to the Uncrowned Queens in Their Hats exhibit, the Geva Theatre also collected hat stories by the honored Uncrowned Queens. 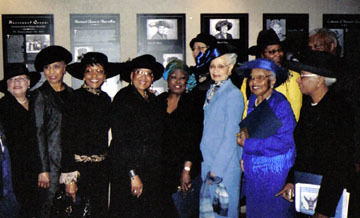 Front row from left to right: Carol Adams, Joan Ridley Willis, Essie Calhoun, Barbara Seals Nevergold, Peggy Brooks-Bertram, Alice Young, Juanita Pitts, and Bishop Violet Fisher. 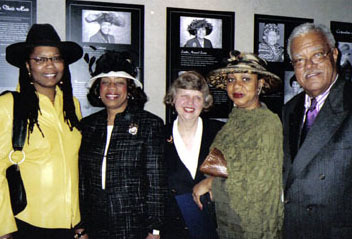 Estella Norwood Evans, Francine Conwell, Zola Crowell and Carol Adams Ruby Lockhart; Pashion Marshall, Common Council President Lois J. Giess, and Mayor William A. Johnson, Jr.
As a young girl growing up in the South, I was required to wear a hat to my Baptist church on Sundays for Sunday School as well as to the regular 11 o'clock sermon. All eyes were on the hats so it was commonplace for young girls and women to exhibit their hats by parading to the front pews of the church. Wearing a hat to church was never a negotiable matter in my family, growing up in a household with my mother, two grandmothers and great-great grandmother. I had much of a desire upon completion of high school to become an educated young woman, move away from the nest and enroll in a sophisticated Southern Methodist college for African American women. I did not get as far away from tradition as I thought. Bennett College for Women required its students to wear hats and gloves to Sunday vesper services and on downtown shopping sprees. I continue to love hats and always wear them when I visit my family church in Greensboro. Though I'm a bit more sporadic with this tradition up North, it remains a non-negotiable item with my mother. Hats have always been an integral part of my attire. My mother wore hats and as children, we weren't really dressed unless we had on a hat and gloves. My most prized hat is an Easter hat that I purchased thirty-eight years ago. I'veworn it every Easter since. I remember when I purchased that hat at B. Foreman Company. My daughter was twelve - she will turn 50 on her next birthday - and I still possess the hat my daughter wore that Easter Sunday. When I was a school administrator in the Rochester city schools, the superintendent always said at board meetings that he could tell where Alice Young was sitting. I never went to those meetings without a hat. When I was a child, Sundays were always special in the African-American Community. It was not only a day of worship and prayer; it was also an important social time. The church was a vehicle for family and friends to come together. Everyone dressed in their very best for church. No matter how hard our grandmothers and mothers worked during the week, on Sunday they were regal queens, wearing hats and "strutting" tall don't the aisle to their church pews. Their heads were held high as they wore their Sunday crown. The hats we big, bold and bright! The hats often personified the women who wore them. They told a story. Women wore hats that dared to have personality and life. The hats were never plain or drab. Like the women who wore them, they had charisma. I salute my mother and all the mothers and their beautiful "crowns". The hat I am wearing in my portrait is a part of an outfit made for me in my last visit to East Africa a few years ago. I first went to Africa as a missionary in 1969. Of course, one is not fully dressed in that culture, without the "head dress." My outfit is purple, denoting my Episcopal colors. The sisters had not met a Black, female Bishop. I was celebrated with shouts, claps, waves, hugs and kisses, and gifts every where I went. I wore my outfit with much pride for the female Bishops who would come after me. One of the greatest honors bestowed upon me in my entire lifetime came from the adult children of one of my closest friends. Following the unexpected need for my beloved friend's adult children to suddenly sell their parents' home and move them into a one bedroom independent living facility, I was called upon to assume the critical task of storing and safekeeping her prized 50 year plus magnificent hat collection. What a daunting and awesome task!! It was with mixed feelings of awe, inspiration, and anxiety that I agreed to assume this highly honorable and formidable task of storing the prized and museum quality collection of my dear friend's hats in my home!! I have wonderful memories of my friend, as she regained her strength and stamina, requesting specific hats to wear to special gatherings and events at the nursing home, especially for Christmas parties and related gatherings! As her health improved, I was able to bring entire seasonal collections of my friend's hats to she and her husband's independent living apartment, where she would display them in their bedroom for both viewing enjoyment and wearing pleasure!! What joy the two of us brought to the nursing home staff and residents when we entered the facility dining room in our elegant crowns!! I'm enormously proud and truly honored to hold the bestowed and well-earned title of "keeper of the hats" by my dear friend's family!! Never underestimate the power of hats to bond sistahs together!! Even more importantly, always wear your church crowns with a profound sense of glory to God, pride, unconditional love, and HATITUDE!! Never underestimate the power of your crowns to bring sheer joy to others!! I grew up in New York City in Brooklyn and Queens at a time when wearing a hat was an integral part of any outfit. Whether going to church or going downtown to shop at Abraham-Strauss or attending a Links luncheon or a club meeting, a lady always adorned her outfit with a hat. One memory I hold very dear was when my mother's club, the Brooklyn Girlfriends, held their annual fund raiser on the lawn of the Brooklyn senior citizen home. I remember a garden party and fashion show to celebrate the day. Big colorful, wide-brimmed hats in organdy were worn with matching organdy full-skirted dresses. Club members strolled throughout the lawn to show off their fashions and show the seniors a happy time. Most of all I remember how those beautiful hats crowned the women's faces and added that "finishing touch" to their outfits. I have fond memories of hats that are tied to my childhood, to church and especially to Easter Sunday. One of the times that I really looked forward to going to church was on Easter Sunday, because each year I got a new Easter outfit. How I loved those outfits! Spring coats and dresses or suits, matching shoes, gloves and of course, matching hats to complete the look. Some of my favorites were yellow or white straw, with garlands of flowers all around the brim. My father was a photographer who captured me, skinny legs and all, in my Easter finery and Easter bonnet. Those photos remind me of a very special time in my life and a tradition shared by many other African American women of my era. Barbara Seals Nevergold, Co-chair, Uncrowned Queens Institute for Research and Education on Women, Inc.